The Grand Tactical Series moves to North Africa. Taking the acclaimed system used in The Devil's Cauldron, this game gives players the chance to explore the struggle of the Free French forces, including two Foreign Legion battalions, as they attempt to holdout against the might of Rommel's Panzerarmee Afrika at the southern tip of the Gazala line in an abandoned fort. The Free French, composed of "gaullists, swashbucklers and criminals of twenty different nations" according to Rommel's aide Alfred Berndt, had to hold out against the Germans and Italians as Rommel tightens the noose around the French by adding more and more strength to try and crack the Grosstuzpunkt. Three times the French were asked to surrender, each time they refused, with General Koenig stating that there was "no question of surrender." 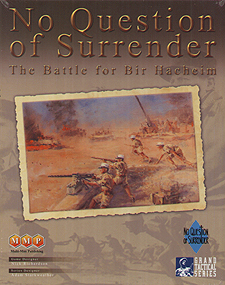 No Question of Surrender is the first game in the Grand Tactical Series of company-level games offered by Multi-Man Publishing to examine the North African campaign. The game includes new terrain types to the system and new special rules to cover events from the battle. An attack by the entire Italian Ariete Division on May 27 (to allow players to explore if the Italians could have captured Bir Hacheim in a coordinated attack). The savage battle over Point 186 where the Germans briefly captured the pivotal observation point, only to be repulsed by the Free French. And finally, the full siege starting on June 2, 1942 as the Free French try to hold out against an ever increasing Italian and German force. Taking the same level of care and detail that was observed in The Devil's Cauldron, No Quest of Surrender continues the excellence in gaming expected from the Grand Tactical Series.